Small with short hindwing projections. 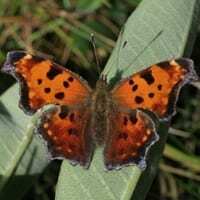 Forewing above is brownish-orange with dark spots; one dark spot at center of bottom edge. Hindwing above has two patterns: summer form is mostly black, winter form is orange with black spots; both have a dark border containing pale spots. Underside is brown; hindwing with a central silver or white comma which is swollen at both ends.